"Reproducing the Middle Ages 1 Sword at a Time"
Darksword Armory was founded by Eyal Azerad, whose lifelong dedication to the study of Medieval and Renaissance Sword-making resulted in the creation of the business in 1996. Through decades of scholarly research Darksword Armory produces battle ready medieval swords for sale, able to withstand the rigors of actual combat, while remaining true to the size, weight, and dimensions of the originals. Each Medieval Sword is researched through examples found in Museums, private collections, and other historical sources. Darksword Armory’s commitment to historical authenticity means that, just like their historical counterparts, each sword is an authentic reproduction of the originals. The original swords are used as templates to produce medieval style swords closely resembling historical artifacts while also benefiting from modern materials and blacksmithing techniques. Each blade is made from 5160 steel, a high-carbon steel of superior quality, and tempered through a special heat treatment that creates what is known as dual hardening. This causes the edges of the blade to be hard and able to maintain maximum sharpness while the center of the blade is more flexible and able to absorb shock. The process of dual hardening used at Darksword Armory creates a sword that can keep a sharper edge longer while being resilient enough to withstand heavy use. This was a well-known technique discovered by historical smiths and carefully replicated by the Darksword staff. Unlike most modern sword reproduction companies, each piece is hand forged in North America. After each design has been researched at the historical source it is painstakingly recreated by experienced bladesmiths. Once constructed, their Swords undergo a rigorous testing process that examines flexibility, durability, blade hardness, and handling. Third party tests have been done on Darksword products for many years, some of them destructive tests designed to push the limits of the Swords. These tests have helped develop Darksword Armory’s reputation as being one of the best manufactures for producing functional, historically accurate medieval swords on the market today. The Darksword Armory’s team is composed of six individuals, all specialized in the production of historically accurate Medieval Swords and Armors. In the 20 years since their beginning Darksword Armory has grown from a small operation into an internationally renowned source for quality medieval reproductions. Swords from Darksword Armory have been featured on stage, in Hollywood films, and are acquired by collectors from all over the world. Due to their growing popularity they have seen their sales increase between 25-35% per year for the last five years. 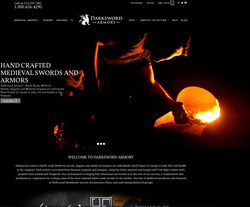 To commemorate their anniversary, Darksword Armory has released an updated website with enormous user interface improvements. The revamped website features improved high-resolution product photos, new user-friendly Blog Page design, and easier navigation across all platforms. Product photos are displayed vertically and have been optimized for smartphone and tablet browsing. They have also released a line of 20th-Anniversary Darksword Armory apparel and a series of Damascus Steel knives in their brand new Halstein Forge Line.